So, you’ve bought some koi, and you’re unsure how to best stimulate their healthy growth. Or, you’re worried about their seeming lack of appetite for food pellets, and the mess that tends to be left behind. Feeding koi can be quite an entertaining affair, thanks to the happy nibbling the fish often do. However; it can also lead to stunted growth, or worse, a pond full of waste, bacteria, and algae. Worry not, there are a few simple guidelines to follow when feeding your beloved koi. With an eye on the temperature, the five-minute rule, and the proper set of treats, you can guarantee their healthy growth, survival, and a reasonable price when putting your Koi Fish for sale. Koi are cold-blooded creatures, much like their cousin carps. Their metabolism is very much tied to the temperature of their water. What this means for you is that their feeding habits change over the seasons. In temperatures less than 9°C / 48°F, they eat very rarely, if at all. Trying to feed them at this point may cause more harm than good, as the food may either rot inside their bodies or cause bacteria population to flourish. Water temperature also affects what sort of food works best. For temperatures above 9°C / 48°F, but below 18°C / 64°F, it’s better to feed them easily-digestible fatty food; particularly those that primarily contain wheat germ. Proteins tend to be poorly-digested at this temperature, and your koi would appreciate the energy boost in preparation for winter, or as their first meals after the cold. Here it’s advisable to only feed them up to two times a day as their digestion is still likely to be slow. When summer heat strikes in the range of 18°C / 64°F to 31°C / 88°F is when the protein should come out in force. Fish proteins are the most ideal for this, though it is still good to mix up their diet with some fruit, vegetables, plankton, and shrimp. Depending on the heat and appetite of your koi, you can go from two to four feeding sessions a day. Should it get hotter than that, it is advisable to cut back on feedings as the increased stress, and potential oxygen loss could get to your fish. It is best to maximize oxygen supply by regularly cleaning the water and filters, and maybe add some aeration. This leads to the next thing to know when feeding koi – the five-minute rule. The five-minute rule is simple: give your koi just enough food that they’ll eat it all in five minutes. If anything is left behind after those five minutes pass, scoop the leftover food up and give them less food next time. It’s preferable to underfeed koi than to overfeed them. Underfeeding can stunt their growth. 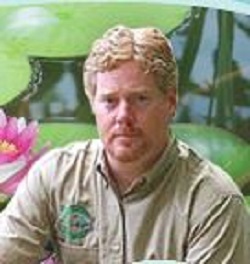 Overfeeding can lead to an abundance of waste, bacteria, and algae; all of which can cause koi loss due to oxygen loss. A good way to check if you’re underfeeding them is to watch their growth and traits. If they look stunted, sunken, or their growth goes below the average of ½” to 1″ per month; then they could stand to be fed a little more. 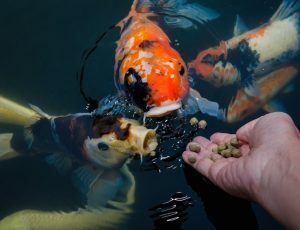 Underfeeding them, especially in hot weather, can reduce their worth when putting up koi for sale, and in extreme cases can lead to an early death by starvation. While standard fish food emphasizing both fish-derived oils and vegetable oils is still the best choice for koi fish, it may be prudent for you to switch around their food before they grow too accustomed to one type. Like humans, koi enjoy variety in their food. While changing food types, a few weeks is enough for adapting them to another season’s diet. Koi do enjoy a treat or two every so often. Your koi will enjoy fishy treats like worms, algae, shrimp, vegetables, fruits, and even certain snacks like Cheerios. A slice of orange, chopped into quarters, is also a good treat, particularly for raising their Vitamin C levels. Treats like this should be used sparingly, and never as a substitute for proper food. Proper feeding of koi fish for sale can be a little hard with changing metabolisms, seasonal needs, and easily-disrupted environments. It can still be rather fun however, and nothing quite beats the maternal instinct of feeding your beloved pets. The benefits of proper feeding also extends to sales; with the proper care they can grow large enough to turn a large profit if you put your koi for sale. I hope these tips and guidelines from Ryan make your feeding times more enjoyable and more informed! Thanks Ryan for the guest blog spot!! I love koi fish, this is soo cool though. I had no idea I could hand feed them!